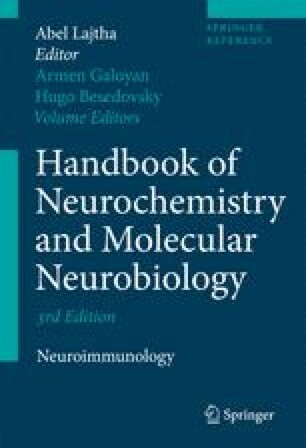 Neuropeptides and cytokines expressed within the brain and the immune system can act in association with circulating cytokines, catecholamines, and glucocorticoids to form an elegant bidirectional symmetry of brain–immune system communications. Interactions between these compounds are critical for the maintenance of homeostasis during immune system activation and during chronic inflammatory stress. Now that many fundamental principles governing the general anatomy of this network have been established, a major research challenge lies in elucidation of the functional roles of cytokines in the brain and neuropeptides in immune tissues. This chapter will focus on immunoneuropeptides, expression of many of which is altered in autoimmune diseases and also in models of chronic stress associated with inflammation. This has led to the proposition that immunoneuropeptides may be involved in underlying processes in the development of, and the responses to, acute and chronic inflammation. In support of this concept, potential for modulation of inflammation in vivo and in vitro has been demonstrated for many neuropeptides synthesized within immune cells. The purpose of this chapter is to summarize the evidence for involvement of immunoneuropeptides in disease processes and to discuss potential antiinflammatory therapies that may arise from our increased understanding of the roles these compounds play in immune responses. We are grateful to The Wellcome Trust for their support for our research into neuroimmunological interactions.